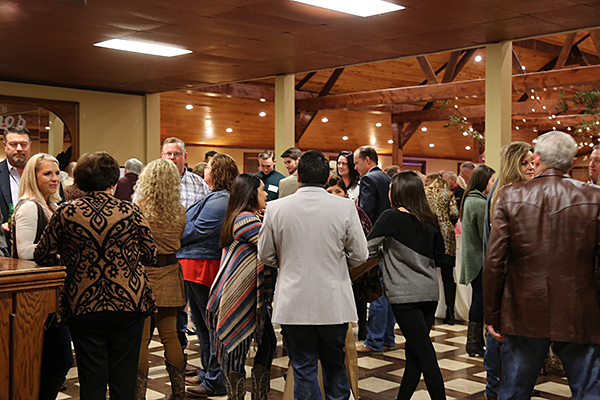 Attendees enjoy drinks, music and more on Friday at UHV’s A Night for the Jaguars fundraising event. UHV Athletics welcomed community members to Club Westerner with dinner, a dance and a live auction that raised money for UHV student-athletes. A large and energetic crowd was on hand Friday night to help support the University of Houston-Victoria student-athletes at the “A Night for the Jaguars” fund-raising event at Club Westerner. Through the support and generosity of those in attendance the UHV athletic department was able to raise around $25,000 for scholarships for UHV student-athletes. The Jaguars, beginning their 11th year of athletic competition, have flourished with a very successful program that includes several conference championships and trips to the NAIA Championships in the sports of baseball, softball, golf and soccer. The UHV men’s soccer team wrapped up the fall with its best season ever winning their first Red River Athletic Conference championship and earning its first berth to the NAIA Opening Round Tournament. Through the years the Jaguars have received tremendous community support from Victoria and Friday night was another example of that support. Hollinden marketers + strategists was the Presenting Sponsor for the event, while Stewart Title came on as a Goal Sponsor, and Civil Corp and State Rep. Geanie W. Morrison were Birdie Sponsors to help kickoff the fund-raising efforts. A large portion of the funding came in a spirited live auction that brought in over $20,000 and included an exciting back-and-forth bidding war for an autographed Nolan Ryan baseball and VIP tickets to a Round Rock Express game that eventually sold for $6,000. Among the other live auction items were autographed baseballs by Craig Biggio, George Springer, Dallas Keuchel, Carlos Correa and Jose Altuve, along with University of Houston Cougar football and basketball packages, a Houston Symphony package, a home or business security system from VCS Security Systems and a Fort Worth Rodeo, hotel and airfare package. Other auction items includes two NASCAR weekend packages, a guided hog hunt, a King Ranch wooden and leather rocking chair donated by First Community Bank, and a guided fishing trip for four at Empire Lodge of Port O’Connor. The event concluded with a dance featuring music by the Scott Taylor Band. All monies raised from the event go toward scholarships for the UHV student-athletes.